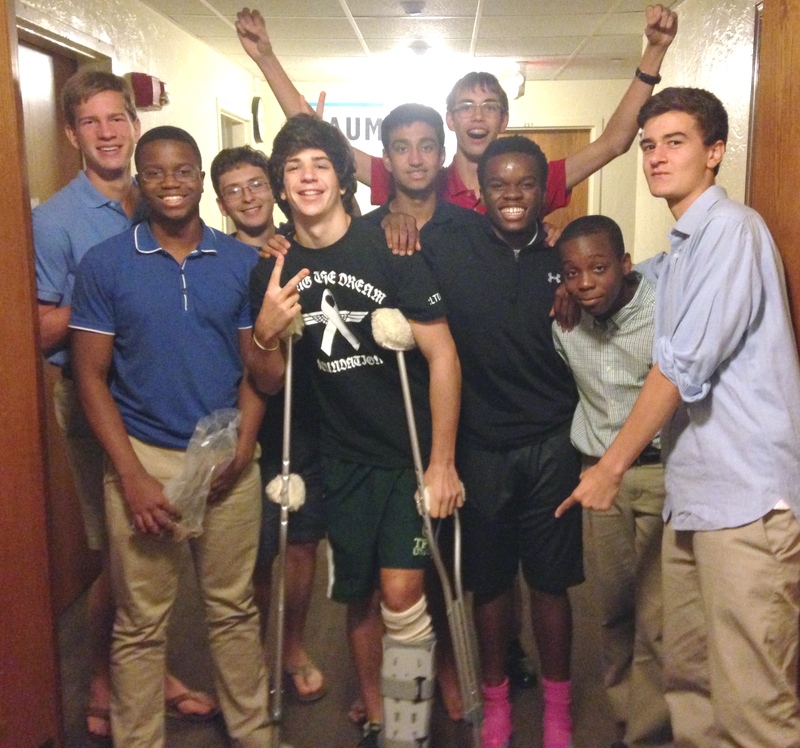 Sam suffered a brutal leg injury while defending his goal in a JV soccer game a few weeks ago. Three teenage boys running full-speed at a ball is the short version of the story. Nurses, trainers and coaches were on the scene immediately to stabilize him and direct the ambulance. An hour later he was at Christiana Hospital where Janice Nevin ‘77, P’13 was recently named CEO. His parents were on their way as was Headmaster Tad Roach. Sam had surgery that night. The next day he was in his hospital bed when Riley Shipley ‘16 arrived with a card signed by almost every member of the community. Louisa Zendt ‘78 suggested she “just put the card in the Main Common Room and see what happens.” It was filled with well wishes within hours. He headed home to recover and a few days later his parents hosted classmates from Norway and Germany for Long Weekend. More smiles. Preparation for his imminent return to campus was swift and well coordinated by dorm parents and teachers. The cast that would be on his leg for weeks necessitated a room change from the third to the second floor of Founders Hall. There was no hesitation from students. “Just tell us what you need,” has become a familiar refrain. When he returned this Monday his things were already in his new room, as was his new roommate who welcomed him with a big smile. An unofficial welcome party commenced in the hall and there hasn’t been a minute since when someone wasn’t there to lend a helping hand. So far so good, St. Andrew’s, but the test is, of course, not over. I might argue that it’s just begun. Sam faces a long journey back to recovery and there’s a risk that the novelty of wheeling an appreciative and smiling guy around campus might eventually wear off. I have faith, however, that this community will succeed to lift Sam up as they continue to take care of him and each another.